I had a ton of mail to look through last night. My favorites are always the freebies and coupons mailed to me. 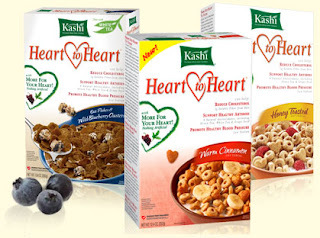 One nice surprise I had in my mailbox was a Free sample of Kashi Heart to Heart Cinnamon cereal along with a coupon for a FREE box of Kashi Heart to Heart cereal or crackers and another 3 coupons for $1.50/1. I've got my fingers crossed for another Target gift card deal on these! All of this was compliments of Vocal Point, a site where moms can try out new products and give their feedback. If you aren't a member I suggest you try and join HERE. There are some questions you will need to answer to see if you qualify. Like I mentioned it's a site for moms so keep that in mind. Also if you are a current member of Vocal Point you can also go and request a FREE sample of Puffs Plus from them HERE. You'll need to sign in to request it and it'll take 3-5 weeks to arrive. I just did it so they are still available but do it quick, you know how these things go! These usually come with coupons (like the Kashi) so hopefully the Puffs will too!